A few years ago, I would have never made a "healthy" muffin. But then again, a few years ago, I wasn't covered in oatmeal slobber, marker stains, and sticky pineapple juice all courtesy of the babies. All that to say, I've changed my tune a bit. In the interest of full disclosure, I'd still rather have a giant chocolate chip muffin, slathered with butter and a generous crackling crust of sugar but the truth is, my body (and jeans) just can't handle that the same way anymore. Plus, the babies would understandably refuse all other food once they tried said chocolate chip muffins so for now, no chocolate chip muffins. Needless to say, I approached this month's Blogger CLUE challenge with chocolate chip muffins (not) on my mind. The theme was berries and I wandered on over to my blog buddy, Alice Mizer's blog, A Mama, Baby, and Shar-pei in the Kitchen wondering how I could incorporate the theme and feed that muffin craving at the same time. Alice is a proud mamma to two babies of her own, and her husband is a member of the US Air Force so their family has lived all over the world. Luckily, Alice had muffins (oh thank God)! Not only that but her Any Berry Yogurt Muffins were in line with this month's berry theme, and they were healthy'ish! Now before you scoff, hear me out. I was a bit skeptical too because well, a berry yogurt muffin does not inspire confidence in the same way that a chocolate muffin does. I tweaked Alice's recipe to create Blackberry Yogurt Muffins (with oatmeal!) and wait for it, they were really good! The muffins were filling without being dense, and jammy in the best possible way. The yogurt help keeps them moist so you don't need a giant slather of butter (but if you were to go there, I'd never judge). Plus, they come together very quickly so they're perfect for those midnight baking sessions when it's your turn to send the snack to daycare but you kinda, maybe, sorta forgot (not that that would ever happen around these parts. We're all about planning ahead, making things ahead of time, and scheduling every thing in those fancy, artsy day planners that all the rage on Instagram). Oh, and the muffins have very little sugar so you can feel good about serving them to the babies. That is, until you are ready to introduce them to the wonder of chocolate chip muffins! We love muffins or any grab and go breakfast foods and the fact that these are healthier make them that much better. I'm so hungry right now and I want one of those muffins. They'd be great for breakfast, and I love your photo with the milk. I love blackberries - so even though I am a chocoholic - these would be hard to resist! Berry muffins are the bestest! Even if that is not a word....love moist and jammy muffins. I know they were happy at daycare...that is if any of these delicious muffins got that far! Looks like muffin perfection to me!!! And while I'm a bit of a chocoholic, I'd take a berry muffin any day. I love making healthy (or healthy"ish") muffins for my kids. They are kind of used to it now (they are teens) and actually look for healthier version when they are out on their own. You are doing a good thing for those little cuties. #success ! Those muffins sound perfect to me! Nothing like a guilt free, healthy muffin to enjoy with my morning tea! Very nicely done! I beg to differ. I would take these over a chocolate muffin any day! :) Great pick! These look so soft sot and delicious! 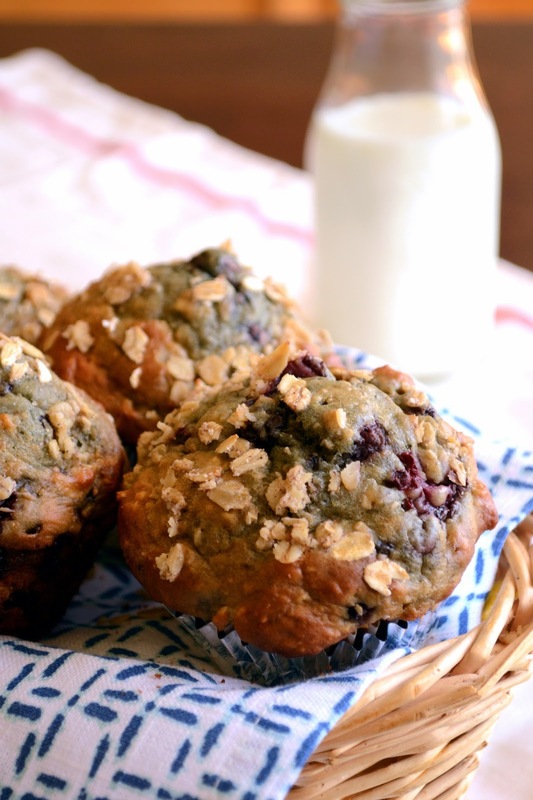 I love blackberries and one of these muffins for breakfast sounds so good right now! I'm with Deb. I'll take these over chocolate muffins any day. They look absolutely fantastic. You should have included the recipe so we can make them! Oh my goodness - these look absoluely divine! Love the addition of the yogurt! Yumm!!! I love blackberries, and happen to have some in my refrigerator - looks like I know what I'm doing with them this weekend! I was just looking for the actual recipe this morning so I could make a batch - am I missing it? I don't see it!! Ack! At first I was like "chocolate chip muffins?? I'm totally going for one of those right now," but then I took another look at these amazing blackberry yogurt muffins! ;) I love how they're packed with fruit and yogurt but are still decadent. Muffins I do like but have never tried out a blackberry one. Those muffins look really good. Blackberry is my favourite.